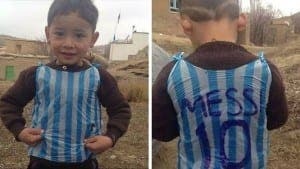 THE Afghan lad who captured the hearts of the world by wearing a homemade Lionel Messi shirt has received the real thing. 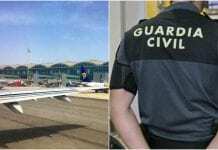 Signed by the Barcelona captain, a replica Argentina shirt was flown out to the Ghazni province of Afghanistan for five-year-old Murtaza Ahmadi. An online search for the boy was sparked after a photo of him wearing a striped plastic bag went viral. 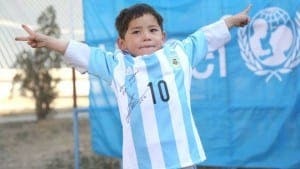 Messi himself weighed in saying he wanted to give the boy a real shirt. “I love Messi and my shirt says Messi loves me,” Murtaza said when he finally received the real deal.